Vintage Hammond B-3 There is nothing like a real B-3 Hammond Organ. I use this in my personal recording studio and you can't compare the sound of the digital sampled keyboards to this vintage instrument. For one thing you have two keyboards, and real-time control of the drawbars. 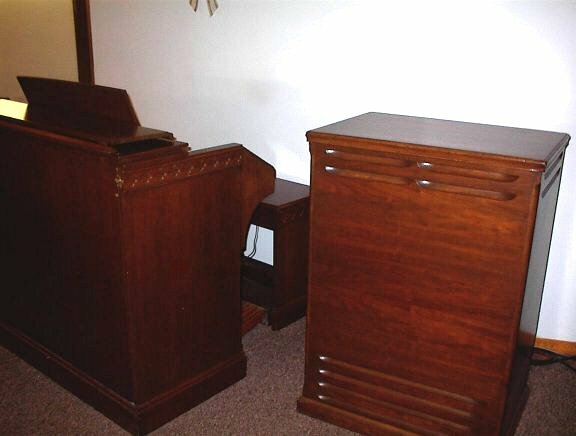 The Leslie speeds up and slows down not by digital Doppler effect but through acoustical random, real time air waves. The discriminating ear knows the difference. Vintage Hammond C-3 This is the same as the B-3, but has more of a cabinet. This one comes with Treck II Reverb and a Leslie 122.